April | 2015 | cut it out, stitch it up! So I’ve made my own jeans and I’m really chuffed! The rivets arrived from castbullet.com in the US last Friday. I had been waiting eagerly for them and kept being disappointed by the postman then on Friday morning I heard a packet ‘clunk’ to the floor and I knew it must be them. Woohoo! 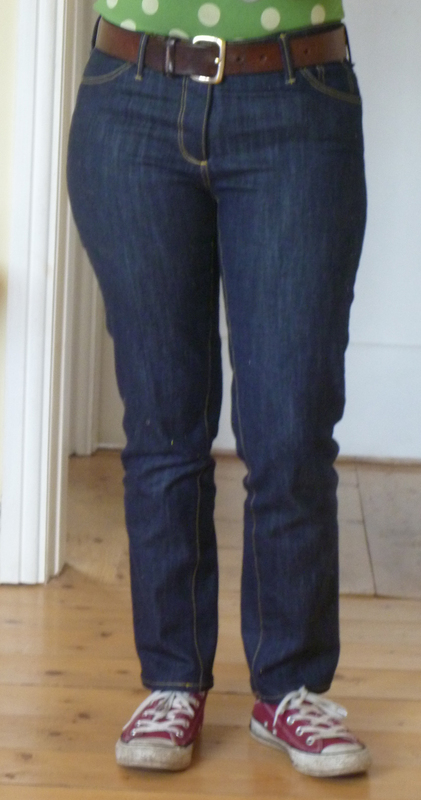 First ever pair of home made jeans (photo taken in the mirror, the coin pocket is really on the right hand side). I followed the instructions from Fehr Trade on how to insert. I cut the prong of the male half down once I had put through the fabric using wire cutters. I first tried to cut down first then push through the fabric but soon realised without the point that wasn’t going to work…. Anyway, once in just banged a few times with the hammer and all worked fine! No stress. I can’t recommend the Craftsy Jeanius course enough. I just wasn’t expecting it to be such a success. I followed it to the letter mostly but I chose to sew my inside leg seams first and topstitch them rather than sewing the outer leg seams first. There’s no mention of felled seams in the course. I was going to flat fell the back yoke and the front and back rises just like the jeans I was copying but in the end I just overlocked. Next time I’ll make a two piece curved waistband, my body shape needs more of a curve than I achieved curving the straight band with the iron. The original jeans don’t need to be worn with a belt but these do. I didn’t do any distressing on this pair, there are things you can do using sandpaper for an authentic look, so I’ll just see how these wear down over time. I really liked this post from Taylor Tailor showing his jeans new then 3 years on. I am really proud of these jeans. There are areas which I can improve on for next time, the fly looks OK when zipped but inside the flap isn’t wide enough so the button is placed quite close to the edge of the waistband. I also think they are a tiny bit short. I’m wearing today with ballet flats and the length is just right but wearing with Converse I think they could have been longer. I think there is more fabric in the double fold hem than there needs to be so I could probably eek another ½ “ out of the length. I’ll wait and see how I feel after a few more wears. The fabric, cotton with 3% lycra, is super comfy. I wore them today riding my bike to work and they felt great. I really didn’t think I’d get around to making jeans, they seemed like such hard work with too much that could go wrong but I’m so glad I made the effort. So if you’ve been thinking about it just take plunge!